The country is divided by civil war pitting Cleopatra’s supporters against those of her brother and her husband, Ptolemy, who is ravaging the country. In this climate of terror, Thomas, a young apprentice to Akkad, Cleopatra’s astrologist and astronomist, falls in love with his master’s daughter. One day, in horror, he discovers that both master and daughter have been kidnapped. Thomas sets out on their trail and learns in the course of his investigations that Cleopatra herself has asked Akkad to make a specific divination, and that the partisans of Ptolemy are behind the kidnapping. Cleopatra promises Thomas that in exchange for the tablets required for the divination, her guards will find the master and his daughter. 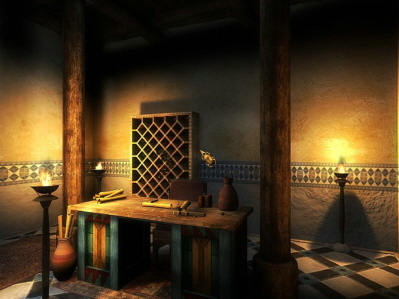 Thomas’s investigations lead him to the discovery of Egypt’s legendary sites such as the Library of Alexandria and the Lighthouse. Thomas also meets the queen and a whole host of other mysterious characters. Will he manage to save his master and his loved one so that together they can decipher the stars? Without the prophecy, the country will be lost: the destiny of Egypt and its queen are in his hands. First of all, I'm not a big fan of games with an Egyptian theme, although I watch and read everything that can be found about the subject. Maybe it is because I know so much about it and when history is not respected, it makes me nuts. 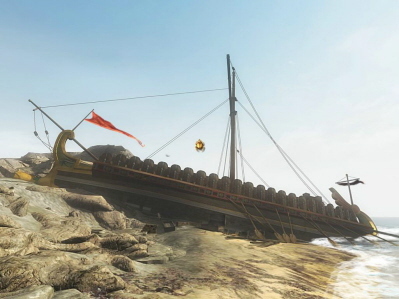 But in this game, the story is based on historical facts and also has a fictional aspect. In Cleopatra: Riddle of the Tomb, you will play the role of Thomas who is the apprentice of Cleopatra's astrologist. The astrologist was asked by the queen to make a divination that will seal the fate of Egypt, but he disappears before being able to fulfill her wishes. This is when Thomas comes in and soon learns that his master wasn't the only to disappear. The astrologist's daughter, whom Thomas loves, has also disappeared. Thomas must find them. The last they heard, they were still in Alexandria which has been devastated by the war between Cleopatra, her brother and her husband. Thieves and vandals are benefitting from the war like vultures around a dead carcass. Thomas' task won't be easy. There are also many, many crocodiles - enough to make you want to make belts or purses with them. Any Crocodile Dundees around? 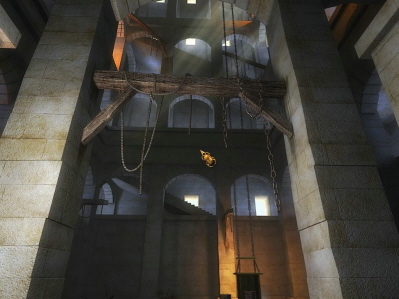 The game includes a nice variety of puzzles and most of them are integrated into the story. Some of the puzzles are inventory based, some are mechanical, and some need logic in order to solve them. There are no time-sequenced puzzles, but most of them are challenging. Have you ever gotten tired of the over-used hieroglyphs? 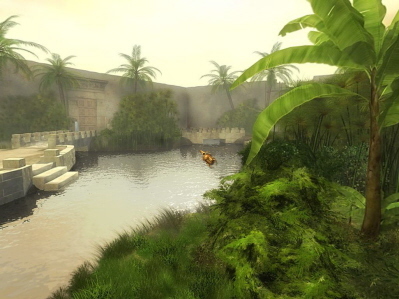 There are some in the game, but not as many as there have been in other Egyptian games. In Cleopatra: Riddle of the Tomb, you will also learn some new symbols. The Greek alphabet is used in some of the puzzles, but since we come across many Greek letters every day, they will not be too strange. Alexandria was occupied by the Greeks for a long time, so no surprises here. Women and men rejoice! There will be some cooking involved and recipes will need to be followed. So put on your chef's hat and get over to those stoves. 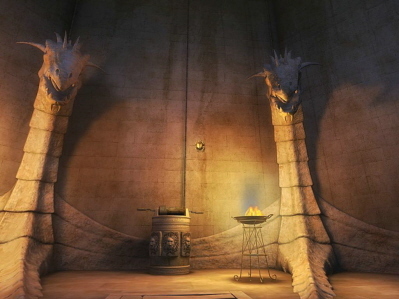 Cleopatra: Riddle Of The Tomb is a first person point and click adventure game. To access the menu or inventory you need to click on the right button of the mouse. You can combine or dismantle objects to create new objects or use them a different way. Several cursors are available. They are an EYE to watch or see, a SCARAB with an arrow to move, a HAND to take, a TALKING HEAD for speaking, and some GEARS to show that an action is possible. 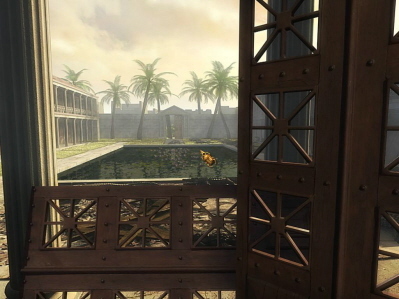 What makes the game so pleasant is the fact that scenes are very colourful, and there are a lot of details to see. The graphics aren’t as impressive as most games today but are still beautiful. A lot of objects can be picked up during the game. When some of them are used they disappear, but a lot are left in the inventory for future use or for combining and sometimes for no reason. Some objects can be picked up but can't be placed in the inventory. They need to be used immediately. It's not very difficult to figure out what to do with them. When you are walking around in the game locations, everything is almost static with very little animation, which is kind of sad. The character animation is a bit rough, but the mouth movements are well synchronized. There is a bit of pixel hunting, but not enough to make you want to stop playing the game. Even if most of the machines used in the game aren't from that time period, they were well disguised, integrated into the story, and hardly noticeable. The sound effects are average, the actors are well chosen, and their voices fit the characters pretty well. There is not a lot of dialogue in the game, and nothing is said without a purpose. The music is pleasant with a nice variety of pieces to be heard. I didn’t come across any bugs; the game ran smoothly. Blood, romance and mystery. What a strange combination! Is it enough to make the game interesting and challenging? I think so. This is a well balanced game, if a bit short. Some puzzles are quite challenging, and the story is interesting enough to make it a good game. There are a lot of interesting things to read, some of which will be new to most of us. The price is also quite reasonable - around $20. Even if the title of the game includes the name of the famous Queen of the Nile, the story isn't about Cleopatra. You will see her in a couple of cutscenes, but that is about it. Thomas is the one who will save the day or not. He is the one history never told us about, but through the challenges he meets, he makes Egyptian history of his own. Thanks Draclvr, Ghostlady, LadyK, Hawka, Angelfire and all of those who helped me with this review. Thanks Darleen! My French brain don't know what TTTT'S is? We have a saying that something "fits to a T." Don't ask me where it comes from, but it means something fits perfectly! I'm sure your French brain makes much more sense than our English ones! Thanks for this review, DB. I just love all games with an Egyptian theme, so this one is a must for me. You are interested in Egyptology, DB? You're welcome and yes, I'm watching all Egyptian stuff on Discovery, have several books about the subject. I got hooked on Egyptology after I had been on the Nile Cruise - What a superb holiday that was. And to see the gold mask of King Tut was awesome! I got hooked after making a paper for school many many years ago, happy that you had the chance to go there, I never been there and probably never will.